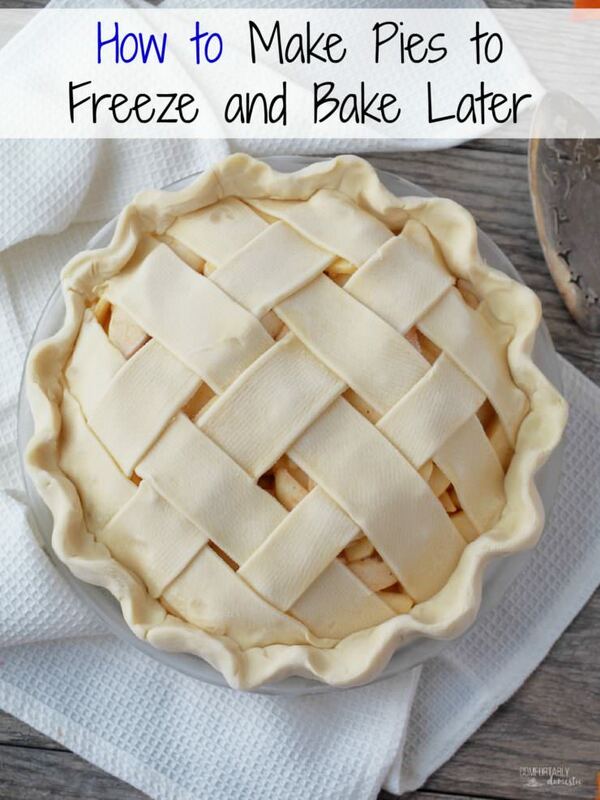 Make pies to freeze and bake later. Making holiday pies has never been easier with this make ahead method to freeze pies and bake them later! Working ahead can be done with delicious results! When it comes to cooking a large meal, I’m all about doing as much work ahead of time as possible. I’ve got enough going on when I’m planning to feed a crowd, the last thing that I want to do is spend all of my time in the kitchen when I could be socializing with my guests. Making pies ahead of time is a great way to save time over the holidays, especially on a such food-centric holiday as Thanksgiving. Thanksgiving is the biggest pie consumption day of the year…for me. I’m pretty confident that I’m not alone in that statistic. While the Thanksgiving feast can be vary between simple to elaborate depending on personal preferences and traditions, there is always room at the table for pie. 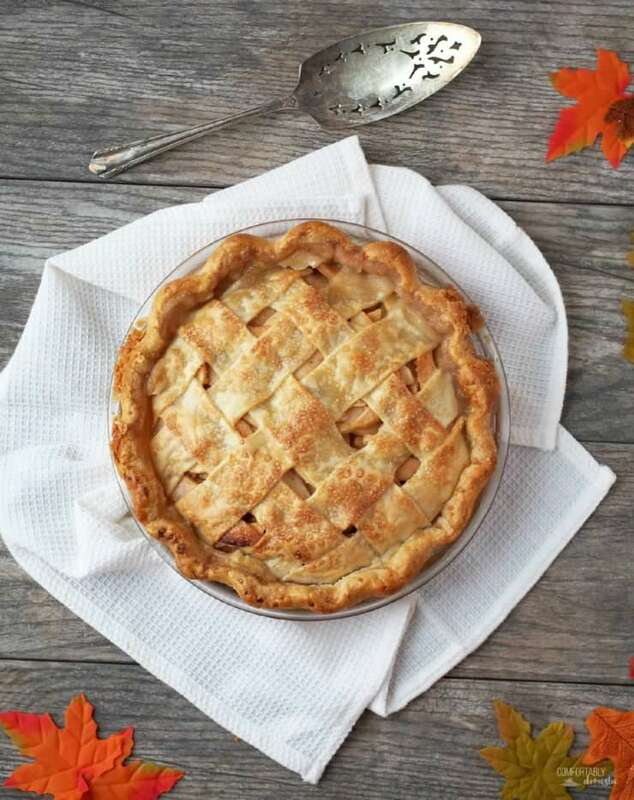 More than 36 million Americans vote apple to be our favorite pie, with strawberry-rhubarb pie, pumpkin pie, and cherry pie rounding out the top Thanksgiving picks. If pie is home, it’s only natural that pie should be served when people come home for the holidays. It’s symbolic! Do you know what pie isn’t? Complicated. The fact that pie isn’t complicated or fussy is a baker’s best kept secret. Pie crust can be made at home in about 5 minutes with just 4 simple ingredients. 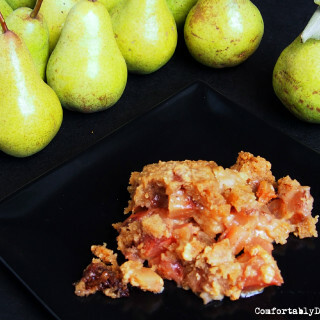 Fill that crust with some sliced fruit, a little sugar, and a touch of thickener and you’re well on your way to one of life’s simpler pleasures–a warm slice of pie! Do you want to know another secret? Fruit pies can easily be made well ahead of time and frozen to be baked another day. True story! Fruit pies freeze beautifully. A frozen crust also shrinks less when baked than a freshly rolled crust, so it holds its shape in the oven. In fact, filling and freezing a pie before baking it virtually eliminates the threat of a soggy bottom crust! I learned that cool tip from Rose Levy Beranbaum in her The Pie and Pastry Bible . Rose knows what’s up when it comes to pie! So plan your holiday party menus to cook the day of, but save time by making the pies ahead of time. 1. Choose a good, well tested recipe. Choosing a good recipe and using the best quality ingredients available makes all the difference in baking really great pies. I frequently bake and freeze my classic apple pie, favorite cherry pie, blueberry pie, and very cherry berry pie with fresh cranberries with excellent results. I do not recommend freezing custard or cream pies, as the texture of the filling doesn’t hold up well to freezing. Stick with fruit pies when it comes to making them ahead of time. 2. Entirely assemble the pie. Line a pie plate with pie crust dough. Combine the fruit, sugar, and thickener for the filling. Spoon the filling into the bottom crust. Roll out and place the top crust over the filling, crimping the edges as desired. I always use standard Pyrex Glass Bakeware Pie Plate 9″ x 1.2″ Pack of 2 pie plates because glass heats slowly and the heat builds evenly so that my pies bake perfectly every time. I have a stack of these little gems in the cupboard. You should too. 3. 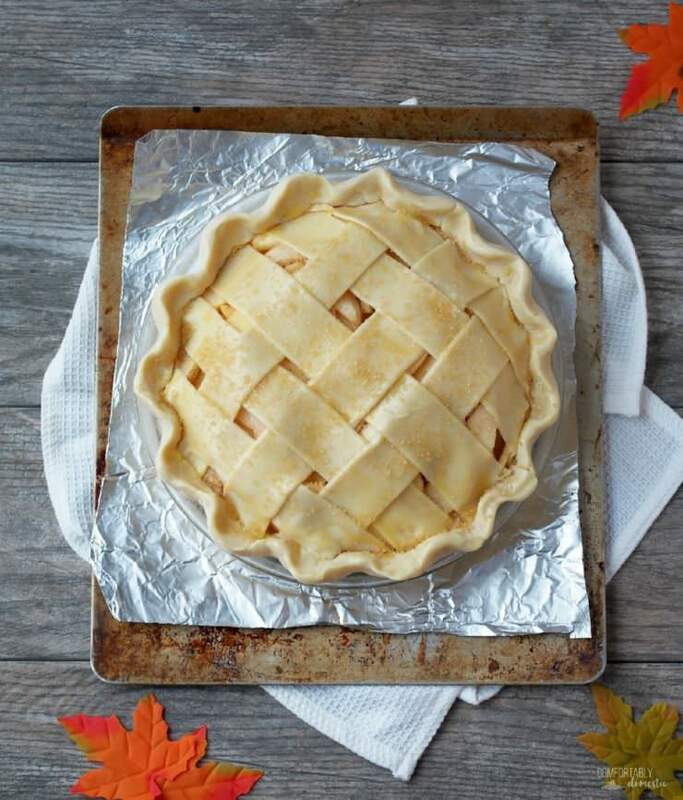 Wrap the assembled pie well and freeze immediately. 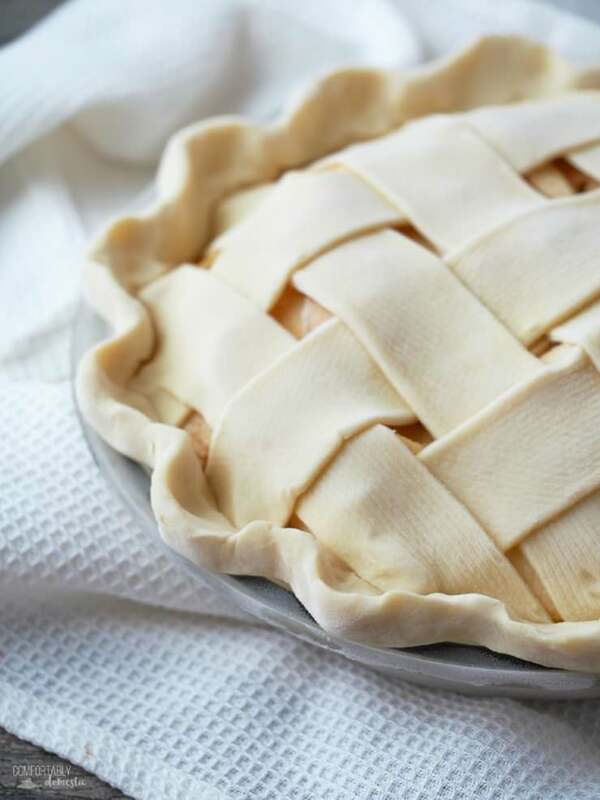 Wrap the assembled pie thoroughly in a double thickness of plastic wrap, pressing to the surface of the pie to release any air trapped between the plastic and the pie. Then wrap the pie again with aluminum foil. Doubling wrapping with both plastic wrap and aluminum foil creates a vapor barrier to help keep the moisture that causes freezer burn out. 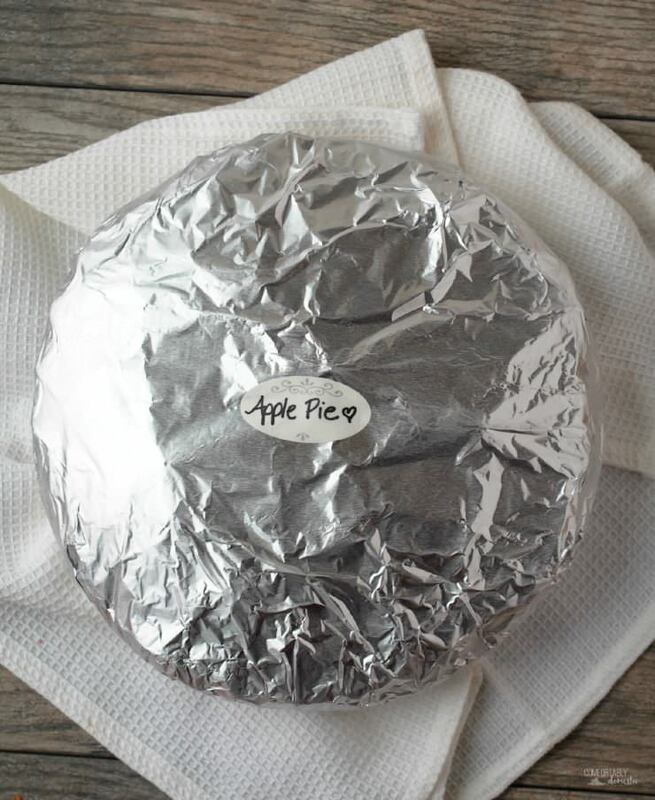 Label the wrapped pie and freeze on a level surface in the freezer. I have frozen pies for up to two months with good results. 4. Bake the pie directly from the freezer. Once the oven is preheated, unwrap the frozen pie and place it on a aluminum foil lined baking sheet. Apply a light egg wash over the top of the pie and sprinkle with coarse raw or granulated sugar, if desired. Baking the frozen pie on the baking sheet will gradually warm in the oven and keep the glass pie plate from being “shocked” (read: shattered) when put in the hot oven. The aluminum foil on the baking sheet makes clean up a breeze by catching any pesky juices that may bubble up and over the edge while baking. 5. Extend the baking time outlined in the recipe by 15 to 20 minutes. Since the pie is baking directly from the freezer, it needs a few extra minutes for the filling to thaw and cook all the way through. Simply extending the baking time stated in the recipe by an additional 15 to 20 minutes (on average) is all it takes. Once the filling nice and bubbly and the crust is golden all the way around the pie is complete. I should mention that although it is possible to freeze a pie after it’s been baked, I find that they don’t hold up as well or taste as fresh as pies that are frozen first and baked later. If you plan to make pies ahead of time to freeze, then save the baking until the day you plan to serve the pie. Simply pop the pie in the oven as you sit down to dinner. Before the dishes are clear, the intoxicating aroma of a fresh pie will invoke that comforting feeling of home with your guests. Previous Post: « Citrus-Herb Roasted Turkey – Let’s Talk Turkey! Thank you, Jett. You make some mighty fine looking pies on instagram, as well! So I’ve never made pie crust before and usually go with the premade ones at the store. I might try your recipe but I do use the store bought one is there anything special I should consider or do differently? I certainly hope that you try my pie crust recipe, Nicole. However, if you go with a premade crust, you don't need to do anything differently to follow this method. Good luck! Do you know if this works for gluten-free pies also? I’be always been responsible for bringing pies to thanksgiving dinner, so I just bake them the morning of. This year I am hosting. Is baking them the day before okay? Anything I need to know for that? Baking pies the day before is just fine! I do it all of the time. Once the pies have completely cooled, I like to tent them with aluminum foil (not plastic wrap) and refrigerate overnight to set. Take them out on Thanksgiving morning to let the pies come to room temperature before serving. Custard or cream pies should remain refrigerated until just prior to serving. Have fun, Kat! Is your pie dough freezable, in a ball? Made your pie crust today, and it was very successful! Not exactly gluten pie crust, but a great gf one! I'm new to this, via celiac grandkids. Can your pie dough be frozen for use later, or should I just make a pie and freeze that? That's great news, Anita! For a gluten free pie crust, I recommend making the pie and freezing it rather than freezing the dough. I want to make 20 pies for our local soup kitchen for the holidays. I was trying to figure out how I was going to make them all in one day. Now, knowing this trick I will be able to make the 6 apple pies ahead and freeze them, which will leave me to make the other pies (chocolate pies, peanut butter pies, and of course the 10 pumpkin pies) for the day before. That is fantastic, Sherry! Bless you for making all of those pies for our friends in need. This is awesome!! One question: how about foil pans? Would this all work the same using foil instead of glass?? Thanks! Yes, ma'am! I freeze pie in foil pans for wedding or potluck pies all the time. To bake, I place the foil pan onto a metal baking sheet. Do you think you can freeze the pie then remove it from the pie pan, wrap it good and put it back in the freezer? When you are ready to bake put it back in the original pan. Definitely, Peggy! Just be careful where you store it in the freezer once the pan isn't there to protect it. Then unwrap it and place it in the original pan to bake as directed. I have heard that tale as well. I have not had that experience with my Pyrex glass pie plates in well over a decade of following this method. Placing the frozen pie on a cold baking sheet helps to gradually warm the pie plate in the oven. so happy to read this as I really need to freeze for TG this year. We like to serve 3 pies - apple, pecan and pumpkin. Do you know if it's possible to freeze pumpkin or pecan pies?? I know that you can freeze pumpkin pie. As we're allergic to nuts, I can't be certain about pecan pie. Thx for the how to on freezing pies. One question I do hv is so many recipes say to bake a pie for 15 min at one temp n then lower the temp for the lay 20 min or so. Is this the same with frozen pies? Thx for your help. .
Great tips and those pies are gorgeous! This is such a brilliant trick, especially during the holiday season! You are the queen of pies!! Thanks for the tips! What a fantastic idea and what a gorgeous pie! I wish I had a bigger freezer or an extra one, I would totally bake and freeze some pies!! So smart!!! I am all about this as well. So many holiday dishes can be made ahead of time and cooked from frozen.